Two versions of a 2018 coin sharing designs mark Hungary’s part in World War I. Defeat in the war led to the creation of the independent Hungarian Republic. Original images courtesy of Coin & Currency Institute. Two new 2018 coins from Hungary commemorating the nation’s participation in World War I include a Proof 10,000-forint coin. Images courtesy of Coin & Currency Institute. The centennial remembrance of World War I, fought from August 1914 to November 1918, is nearing its end, but world governments continue to issue commemorative coinage marking events of that “war to end all wars,” as it was naively called. One of the newest series of coins is being issued by Hungary. Defeat of the Central Powers in the war led to the breakup of the Austro-Hungarian Empire and to the creation of the independent Hungarian Republic. 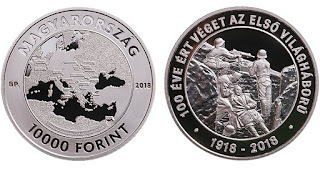 Two versions of a 2018 coin sharing designs mark Hungary’s part in the war: a Proof .925 fine silver 10,000-forint coin with an issue limit of 3,000 coins, and a patinated copper-nickel 2,000-forint coin with a maximum mintage of 10,000 pieces. The coins have three purposes, according to the U.S. marketer of the coins: To honor the victims, mark the end of the war, and note the proclamation of the 1st Hungarian Republic. 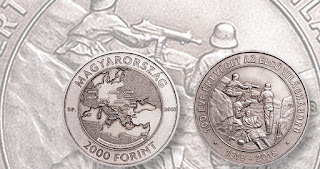 The obverse depicts a Eurocentric map of the world, with the most important World War I battles involving Hungary marked with stars or the outlined names of the locations. Opposing forces and neutral countries are distinguished with different surface finishes. The ring structure on the obverse is also found on the reverse, where the central depiction is a scene from the trenches, highlighting the static nature of the conflict. The cross-shaped form of the trenches also memorializes the victims, according to the distributor. The Hungarian legend in the outer ring translates to “100th Anniversary of the End of World War I,” with the centennial dates 1918–2018 in the lower circular legend. Both coins are 38.61 millimeters in diameter. The silver coin weighs 31.46 grams, the copper-nickel coin 30.8 grams. Prices are $62.50 and $18.50, respectively. The first day of issue is Oct. 16 and they will be available in November. To order, contact the Hungarian Mint’s North American representative, the Coin & Currency Institute, at P.O. Box 399, Williston, VT 05495. Email the firm at mail@coin-currency.com, or click on the Hungarian flag at www.coin-currency.com to order online. Add $5.75 to each order for shipping and handling in the United States. Shipping to other countries will be based on actual cost. Vermont residents must add 6 percent sales tax.